So are there any big differences between a ball cap and an adjuster? One covers the ballstud and is longer with (presumably) more thread bite, but other than that? It’s not a critical question, I know, but it’s bothering me...! Thanks! I find the later ball cap better because of less slop. Still will be some movement but lining inside the ball end with a plastic bag will almost eliminate all slop. I always thought that the ball caps loosened up the more they were removed for adjustment... although perhaps the higher-end ball caps mitigate this effect? It would only really be a problem for non-turnbuckle links. Adjusters work well when you might want to access the top of the ball, say if it takes a hex key and you might want to undo it and move it to a different hole to adjust your roll centre for example. Some people take ball caps and cut the tops off to achieve the same thing. You can get the ball caps in short and long. Also in low friction. Think they also catch less dirt. Just been wondering this myself as I’m going to be needing a fair few soon for something. Cant believe the price difference between the open ended vs ball cup. Considering I’ll need 12 that’s quite a difference. I prefer those closed heavy duty units. They are significantly more durable in terms of holding the turnbuckle. The set on my DT03 worked wonders when someone stood on the front corner of the car, ball cups just popped off, car was not damaged at all. This being said they’ve not popped off in 35mph cartwheels. They are pretty much standard issue on most Tamiya off road buggy’s right through to TRF cars. I keep these in my parts trays for all my off road buggys/trucks. Can anyone recommend a particular brand of ball cap that they have found to be fairly sturdy? I’ve heard this said a few times. Does this limit the movement at all? Does the plastic need replacing at periodic intervals? interestingly on some non Tamiya kits the ballcap part is reinforced with ribs in the predominant direction of travel, and is made of better quality plastic. I did enjoy buying a ballcap remover tool recently though.... someone on TC recommended it but I can’t remember who. 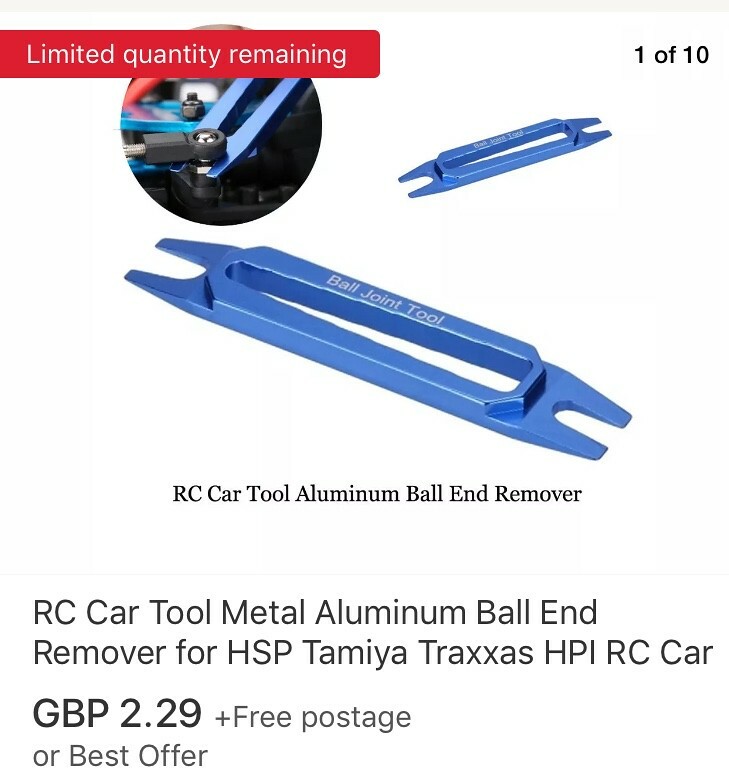 It’s much easier to remove them with this tool, and it’s a nice little bit of ‘kit’ for the RC toolbox.... love purchasing little gizmos like this! Tamiya just released open top ball cups... Can't remember the part numbers, though. The reinforced cups have been very durable for me, even with rough use. Back in the old days factory ball cups on most cars (associated/losi etc) where tiny and fell off easily. Because of that RPM ball cups where the go too upgrade because they rarely came off while driving (but where not fun to get off) the modern beefy Tamiya closed cups are fairly similar to the RPM cups. The only downside of rpm is I’m fair certain they don’t make cups for Tamiya 5mm balls only associated/losi sizes. I could be wrong though. I only have experience of two Tamiya versions. I have a preference for the DT03 ones as they feel better on (subjective). Think I need to get me one of those tools @ALEXKYRIAK has posted. The adjuster on the Schumacher Cougar are an absolute pain to remove. The grip those balls for dear life!